The thread will go where the discussion takes it mate - but I am somewhat sceptical as to the real advantages of actually having one (SL), when they give “Market makers” targets and can be ignored at will, if the market moves quickly. Forgetting the side show… I’m not totally anti SL… I will use a “Catastrophe Stop” (not 400 pips) maybe set somewhere outside of the H4/D1 (or 2 TF’s above the traded TF) volatility levels, for Black Swan occurrences. Falstaff… I think your asking? Whether to use stops at all? As I have shown previously, you can use a strength/momentum indicator to close positions if the trade turns against you, or you can use a preset equity signaled protection, so if drawdown reaches 0.5% - 1.5% of you account, your position(s) will autonomously close. 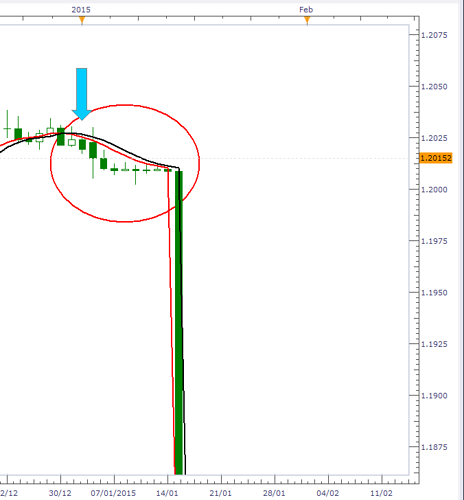 Both of these trade protection methods do not require placing a set SL at a set price or zone on any Chart. I am also wondering whether in a case where the “Stop loss” is gapped through, whether it woud be triggered on the almost universal retracement which follows - thus locking in the loss due to the spike, when it is clear that the market is coming back ? A definite yes, it is all about milliseconds in this example… if there is a large volume (Market Depth) of SL’s or TP’s in front of yours… you stop is in the queue to be processed. NO Indicator, Equity protection or Stop Loss will save you in this situation. I appreciate what you say TwB - and if I were to be away for a week or so, I’d definitely put in a BIG Protection Stop. However as far as H4 or D1 is concerned, That is well within the “broker’s profit lockin” as far as I’m concerned. Now please be aware any new members, that I am not speaking of “daytrades” here ! It seems to me that - just like “Crash Helmets”, "Broker profit lockins" - just lull you into a false sense of security. Maybe it’s necessary to look for better trades - rather than rely on some artificial mechanism to keep you safe ? “Death by a thousand cuts” is not a nice way to go ! I’m yet to be convinced that the events made public in Nicholas Nassim Taleb’s Book as represented as such in Forex, are really anything of the sort ! It is worth remembering that no speculative trader is obliged to trade Retail FX at all. Therefore I think the first thing that any trader should do is establish why they are trading in the first place. For some it may be a diversification of a personal investment portfolio, for others a challenge to pit one’s wits against a market. Some are looking to slowly and carefully build a capital base whilst others aim for a significant regular income. But some may also be betting their life savings, even borrowed capital, for the chance to break out of poverty into a dream life or give their children a better start to their life. And the impact of various trading risks is very different in each case. I confess that although I have personally been involved in financial risk management and speculative trading in one form or another throughout my entire career, it was only when I joined BP here a few years back that I started to realise with horror about the näivity, ignorance and totally reckless risk-taking that characterise many, even most, of the newbies that come here - many being totally unaware of even the existence of the most critical risk factors. Once one has established why one is trading then the next step should be to carry out some form of overall risk analysis whereby risks are assessed and ranked according to their probablility of occurence compared with their impact if/when they are realised. This is no different to what we do, often even subconsciously, in many areas of life. For example, when we fly to a holiday resort: We do not have to fly, but the probability of a plane crash is extremely low, almost zero, so we go - even though we know that the impact should the risk occur, is almost certainly death. We do the same kind of analysis with decisions concerning insurance for our lives, cars, travel, sickness etc. Anything that is low probability/low impact is not a worry (for example, testing a new method with a few microlots). Then there is a broad middle field of varying mid-range probability v.impact combinations which would include the assessment of various stop-loss parameters under normal market conditions e.g. unexpected events causing significant moves (such as central bank comments), broker stop-hunting/spread manipulation, too tight stops risk/reward ratios etc. But then there is the far right of the chart where the impact is extremely high, even critical, regardless of the level of probability - and it is here that we consider the need, effectiveness and value of insurances such as guaranteed stops and equity protection products. 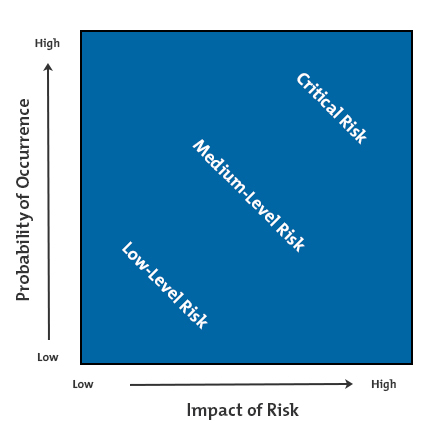 For some, the risk of being in a particular instrument at a particular instant that a black swan type event might occur is small and the impact very painful but not financially decapacitating and equity protection products are not considered necessary. For example, the only longer term positions that I hold in Crude Oil are long positions and if an extra-ordinary flash event occured it would most likely result in a huge upward spike rather than down since supply can be disrupted in an instance but a surge in supplies or collapse in demand take rather longer. But there are many traders who have small, vulnerable, balances that represent a significant proportion of their total financial situation. And for them, the impact of such a risk occuring is financially fatal, and not just in terms of their trading capital. For such people, these trading insurances should be thoroughly evaluated and, if still not sufficiently reliable as a safeguard to cover their risk then they should not trade at all. Some information on the product below… not offered by many Brokers, but it is offered by some of the big ones ie: FXpro, Pepperstone, IC and I believe IG Markets as well. I am dumbfounded that the writer of the piece got it so unbelievably WRONG ! 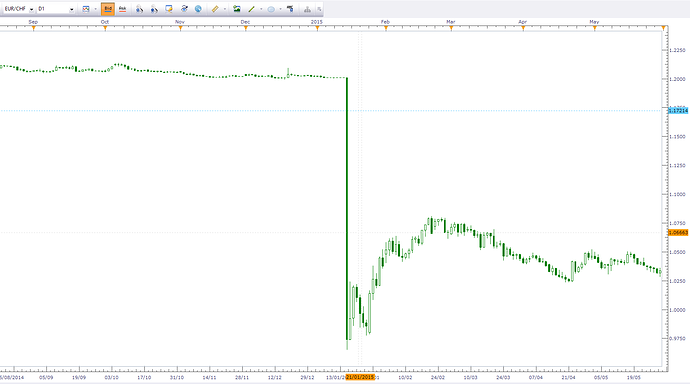 exactly the reverse of that “Forexnews” statement ! 4:30 price trading at a level, 5:30 - All over and price back at the same level (if briefly). Clearly, given that move, If you were lucky enough to be watching at that moment and your stop had been “Gapped”, the right thing to do would have been to remove the stop and let the “automatic rebound” operate before getting out ! With a move of 40% though it is unlikely that anything would have saved you. Maybe something to bear in mind though, for the smaller versions which happen more frequently ? This is a point noted by @Manxx with respect to “Oil” where the likelihood is for a “spike” rather than a “Crash” - small point ? 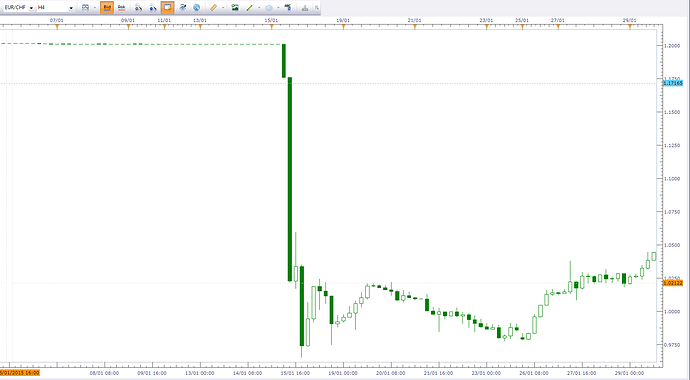 or something to seriously consider as a positive pointer to consider when looking for a trade ? Brokers got into serious financial trouble from that EuroSwiss crash and clearly this was something caused entirely by the way the computerised markets work - They are just “not real” and it is disgraceful that People should lose their houses and Companies should “Go bust” simply because a computerised system has not been sufficiently “Thought through” ! I believe there is a place for Statuory protection as I have said. I also believe that brokers would do well to consider writing into their “Terms and conditions” protection for teh Punters and for themselves by addressing this issue specifically. I do understand that those brokers with some “Hedging” in the real market, may need to consider their positions more carefully than the straight “Gamblers” in this respect. After tha “Black Monday” crash in the DOW of 1987, the FED ? brought in protection to suspend trading if the price went down by 5% in a single day and also instigated the Oft-denied “Plunge Protection Team”. These measures seem to have prevented repetition. 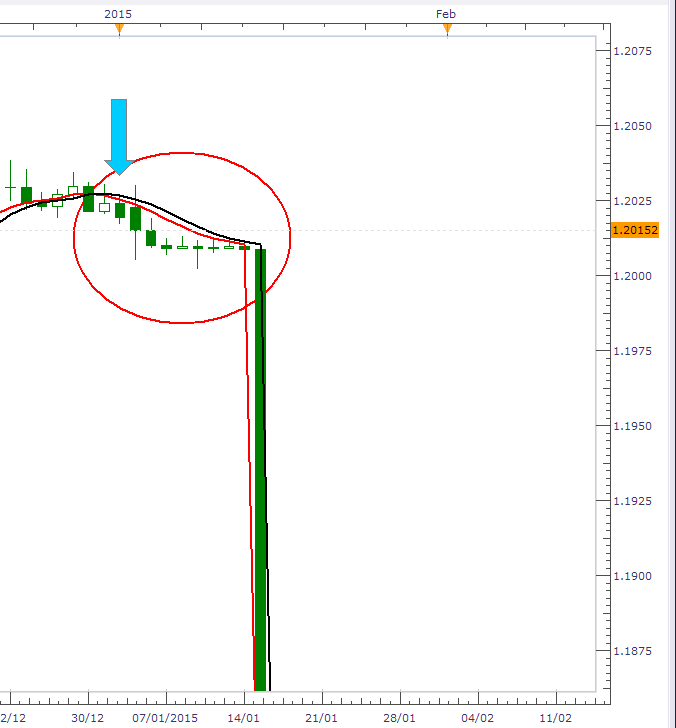 However, similar measures in Forex seem to be quite hard if not impossible to instigate, since if measures were put in place in USA, traders could take bets in other markets to Arbitrage their positions - Guess I’ve just "destroyed my own argument " - lol ! First time I’ve looked at that move and only too willing to accept I could have it wrong. 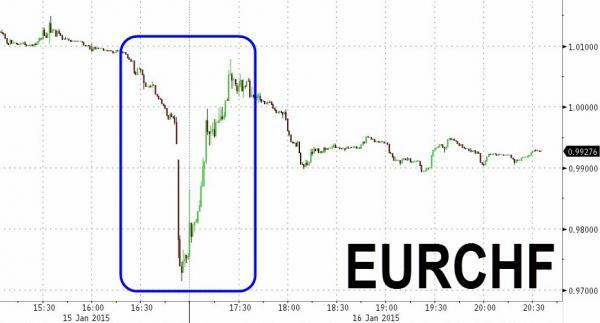 On 15th Jan 2015 EurChf opened at 1.2009. When the Swiss announced they were depegging from the euro, the price crashed to 0.8931 before eventually recovering partially to 1.0095 by the close of the day. Hmm - well it seems I do have the wrong chart - can someone publisha more reliable one showing the move please ? 4H is about the best I can do here - looks very similar! But, of course, this was not bad news for everyone - some people were short! How does one trade through a MM retail broker again? As far as I was aware a MM is a speculative middle house where no transaction, buying, selling or indeed hedging takes place in ANY underlying FX market. Whilst I entirely agree with you concerning the phantom nature of what we “buy” and “sell”, aren’t we a little bit spltting hairs here over a definition of “trading”? Or is there a deeper issue here? Isn’t this more or less the same principle with futures, options, CFD’s and all other derivative products? Does a real ECN broker exist? The reality is whenever you place a forex trade, there needs to be a market maker taking the other side since it’s an over-the-counter (OTC) market. Furthermore, market making is not exclusive to forex. You can visit the websites of several of the biggest futures and stock exchanges in the world to read about how they rely on market makers to provide liquidity and quality pricing. While we do not actively trade against our clients, it’s true that as a market maker, we manage the risk on the other side of customer orders. It’s also true that we have many tools at our disposal to do this, and that’s a good thing for our clients. You’re very quick at finding quotes of which have nothing to do with the question being asked - I can only assume you’re of the passive type. The commodity regulator said in a statement that "between Sept. 4, 2009 though at least 2014, FXCM engaged in false and misleading solicitations of FXCM’s retail customers by concealing its relationship with its most important market maker and by misrepresenting that its ‘No Dealing Desk’ platform had no conflicts of interest with its customers." At the end of the day, who gives a monkey’s cuss about the semantics of what constitutes a “Market Maker” ? Anybody who wants to play childish games and score irrelevant points off each other about nothing with any particular relevance - away and start your own thread ! This is supposed to be a moderately “Grown up” discussion about the place and possible use of “stop-losses” and whether they are a good thing for retail traders, or whether they are actually counter productive, cost you profits and just enable brokers to “Lock in profits” and lull participants into a false sense of security ! It started off pretty well - please keep it going in the same vain !